You know how people who make it really big in their careers always credit their success to the fact that they always knew since they were an itty bitty kid that they wanted to do what they do? Mariah Carey is reported to have begun singing since she was 2 years old. Same thing with Christina Aguilera. I just read something the other day about an 8 year-old blues guitar prodigy. Or maybe he’s not a prodigy but since he was 3, he knew he wanted to play guitar and has obsessively played for five hours a day ever since. Now he’s jamming and headlining at dive bars. While I am passionate about many things (and mind you, I began playing the piano at the tender age of 6 but I am not a career pianist by any means), I don’t really know what it says about me that since I was a little kid I have had a love for the physical act of putting pen to paper, writing in cursive (and writing WELL in cursive), sending and receiving letters, signing up for a pen pal through Teen Magazine…you get the point. That has transcended into a full-blown obsession with pens. Especially colored pens. 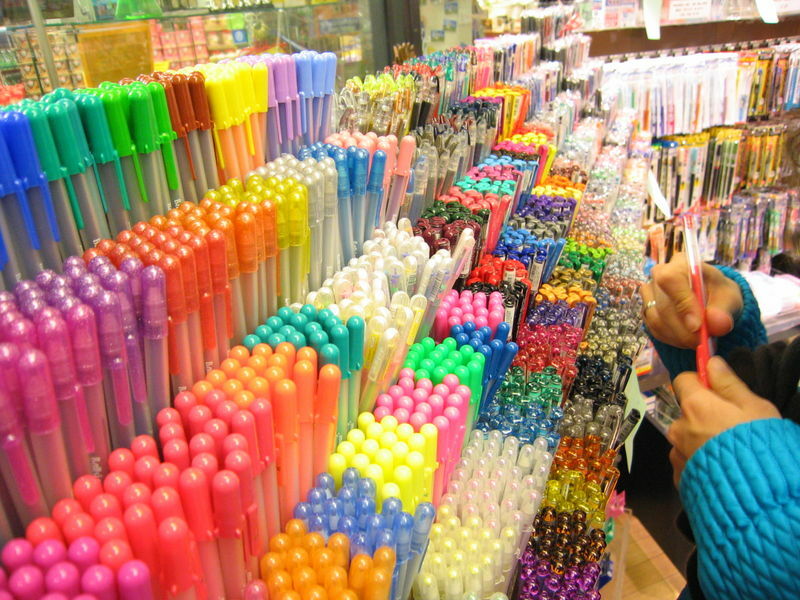 The photo I found online of all those colored pens in a stationery store epitomizes for me the entire pen shopping, pen loving experience. I love looking at all the colors and styles, gel vs. ballpoint, fine tip to medium tip, etc. I can’t tell you how thrilled I was when Sharpie expanded their permanent marker line to include tons of colors, as well as putting them in their fine point line. Even though I may not use all of my pens, and in fact a lot of them dry out before I can maximize their writing potential, I love having the array to look at. It’s bizarre how aesthetic it is for me. Gelly Roll pens are great because they have glorious, beautiful smooth ink (gel pen but also on a fine ballpoint tip) that come in dozens of colors – including silver and gold! I use those exclusively at Christmastime. My favorite though, is Pilot’s G-2 07. 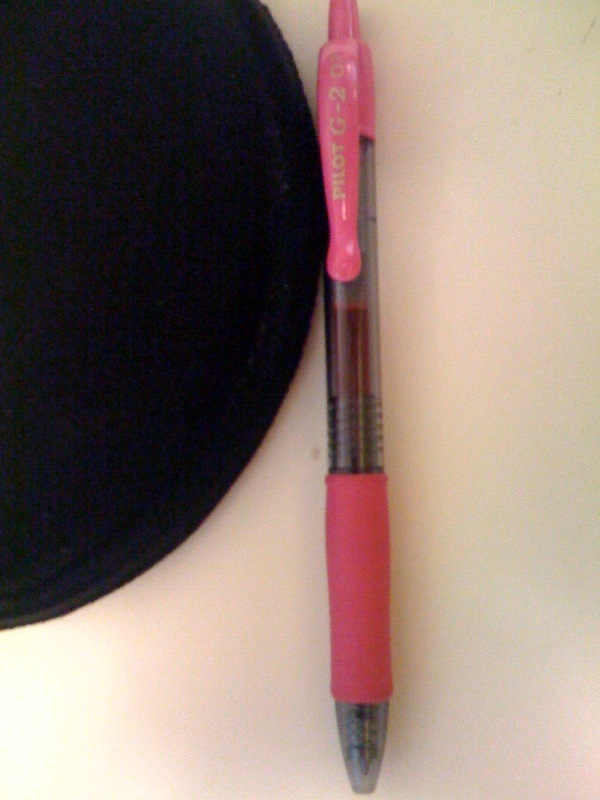 I’m even putting a photo of it on here, just to illustrate its simplistic pen beauty. It’s a gel ink writing instrument with a fine, pointy tip, rubber grip and has the fun clicker so you don’t have to worry about the cap. It’s fun, efficient, smooth, pretty and practical. Wow it’s like looking in a mirror if I were a pen. I began using these in college and when they came out with the expanded color line, I bought several sets and have never looked back. I carry at least one black and maybe one color with me in my purse at all times, so I am absolutely one of those people who always has a pen on her person (versus the person who never has one and assumes that someone else will always have one, which is not always the case. Sidebar: lighters are a different matter. I WANT to be one of those people who has a lighter on me, strictly for emergency purposes, but I never do.) My pen-carrying habit has served me well in New York City, where despite the number of delivery services who now take credit cards, they do not always send delivery people out with pens for orders put on a credit card. Enter Zoe – Mistress of the Pens. 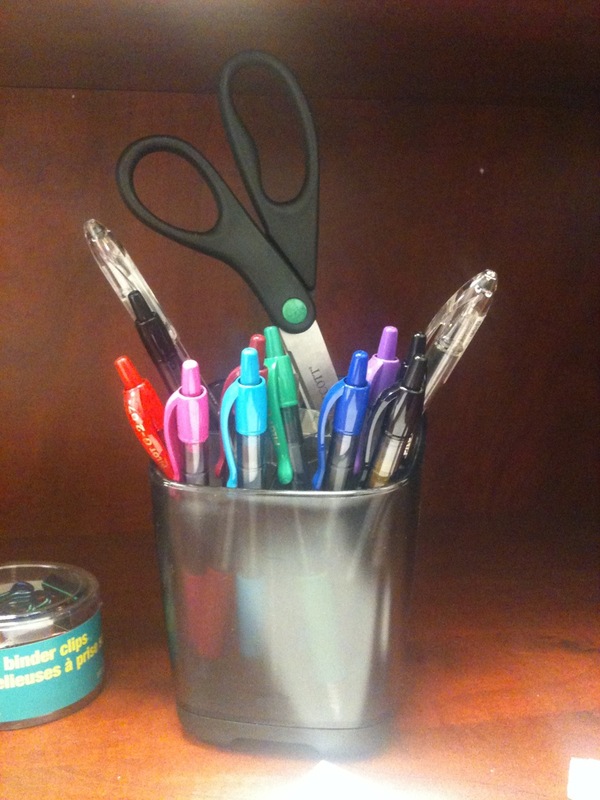 But this also means I guard my pen(s) carefully. If you ask to borrow my pen, I will take all the mental notes down: who, when, which pen, how long you keep it and if you chew on it (ummmm, rude and gross). It amazes me that there are pens that cost hundreds (and even thousands) of dollars in the world. The only company I know of that has some prestige is Mont Blanc but I know there are plenty of others. My mother knows how to write beautifully in calligraphy. Alas, it was a crushing blow to realize that as patient as I am, I do not possess the necessary deftness of hand (or fingertips, perhaps?) to write well in calligraphy. Plus, it’s very messy. Ink everywhere if you don’t know what you’re doing. Once, as a wedding gift, my mother wrote out all the wedding invitations for her best friend’s daughter in her stunning calligraphy. Like, she has to dip the pen in the ink jar and blot it and everything. No wonder people didn’t learn how to write as much back in the day. It took two hours to write four sentences. I would have stayed ignorant, too. Okay maybe not but still, I see the challenges they had to overcome, including how much feather quills, ink and parchment paper had to cost. My problem is that when I go into an office supply store or God forbid a stationery store, where they have all the best kinds of pens in supply (don’t even get me started on stationery), it doesn’t matter how many pens I currently have at home already, I always become tempted to buy more. I love discovering all the new ones I haven’t yet seen and of course I always question if I need a third or fourth gold ink pen – just in case the other ones crap out on me. A girl in a bind is one without a gold Gelly Roll pen. Those Christmas cards aren’t going to have a matching ink-colored theme on their own. Am I a huge dork? Yes. Yes, I am. 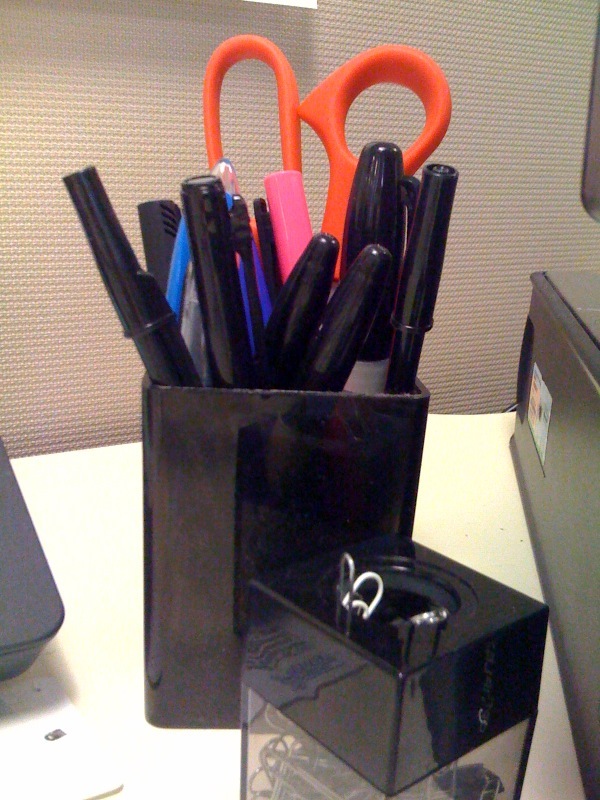 Can you come to my apartment and discover that my pen (and stationery….and boxes of cards…) obsession knows no bounds? You can. Will I be one of those old women who, upon her death, her children (or the authorities…) will go through her belongings and find a variety of beautiful pens in all different shapes, styles and colors? Most likely. But if you were to randomly approach me, a desperate gleam in your eye and say, “Do you have a pen I could borrow?” I can proudly say, “I sure do.” But I will watch you like a hawk until it is returned safely to me. This sounds just like me!! Seven years later, the pen obsession is still going strong. This sounds just like me, too! I’m in grad school online and I hand write everything I have to turn in assignment-wise before tying it, partly because that’s the best way I learn things, but I also love it because I get to use all sorts of different colored pens and styles. I buy my pens on ebay, where you can buy them in bulk, it’s cheaper and there are more colors and styles to choose from. I just bought two 50 piece gel pen sets for $23(per set) their both colored gel pen sets and include glitter, metallic, neon, pastel, regular, and swirl in each set. I have like over 200 pens! I got so many I had to get a container to put them in. I also bought a 50 piece marker set and flair tip set, too. My favorite pens are gel pens (especially the glitter and metallic ones), markers and flair tip pens, and those Bic crystal pens (I think it’s because I like pens that produce wider lines, too). I also like how smooth the ink is in the glitter and metallic gel pens. My name is Zoe also! I was searching on line to find the meaning of why someones is obsessed with pens( becasuse i really am 🙂 and I came across your article. Ever since I can remember i Loved pens and pencils/ stationary in general. You donr want to know how many i have and yes I keep on buying them. It just makes me happy and excited to see, own write and have them. I used to own over 300 earasers back when we did not have the choice of so many exotic ones I owned all kinds of them. Anyways long story I am glade I am not the only Zoe so in love with PENS!! !